Thousands of Iraqis, mostly supporters of cleric Moqtada Sadr, held a silent protest in central Baghdad on Friday, a week after a rally demanding electoral reform turned violent. They gathered on Tahrir Square where on February 11 the security forces used rubber-coated bullets and tear gas to repulse protesters trying to march on the fortified Green Zone that houses the country’s key institutions. There was no violence on Friday and organizers asked the protesters to refrain from chanting slogans. 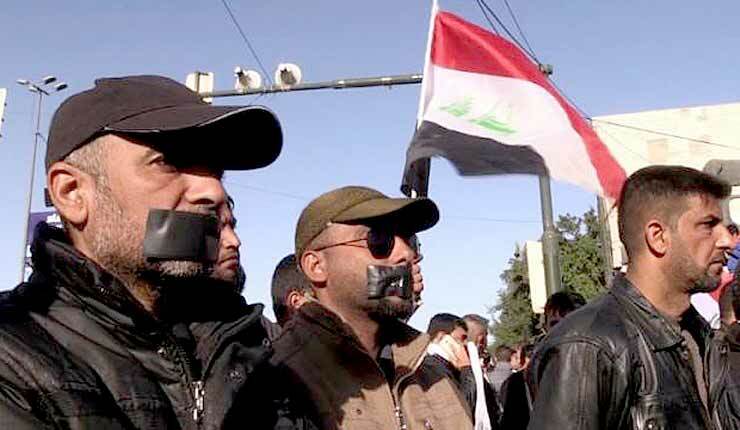 The demonstrators, waving Iraqi flags, remained completely silent for more than a hour, and many of them had taped their mouths. The security forces were on high alert following last week’s violence and a day after more than 50 people were killed in the deadliest car bomb explosion to hit the capital in months. With provincial polls set for September, the protesters want an overhaul of the electoral law and the electoral commission to be replaced, on the grounds that both currently favor dominant parties they accuse of corruption and nepotism.